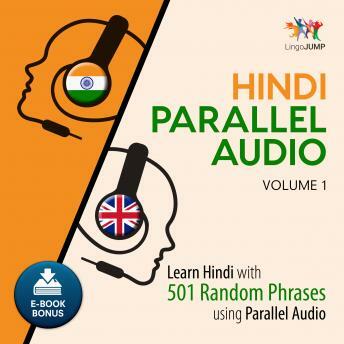 Listen to "Hindi Parallel Audio - Learn Hindi with 501 Random Phrases using Parallel Audio - Volume 1" on your iOS and Android device. We will have you speaking Hindi in no time! Lingo Jump's parallel audio language learning system makes it easy to learn languages at your leisure. Whether you're relaxing or on the go, our simple, clear, and fun audio lessons help you learn through imitation of our speakers. Immerse yourself in a new language with confidence'"we're here to get you talking using phrases that you'll learn with ease through parallel audio. Parallel audio is the key to Lingo Jump's language-learning methodology. Through repetition of clearly pronounced words and phrases at a tempo that's easy to follow, you'll not only find it easier to understand and speak Hindi, you'll also improve your memory, boost your listening skills, and pick up the correct accent. Our speakers follow a specific speech pattern throughout the audiobook, making phrases predictable, and helping you understand words and phrases through context. We keep you solely focused on the language, without any distracting background music. We know that not everyone speaks in the same way. Dialects, tempos, and accents can vary among a country's regions, and even among quarters within a city. So when you start, you'll hear our audiobook narrators using different intonations of repeated phrases, slowing them down, speeding them up, and placing emphasis on different parts of the phrases. This helps accelerate your ability to understand and speak the language naturally. Lingo Jump's unique parallel audio language learning system combines repetition, different speeds, and predictable speech patterns. Simply listening to the repeated phrases helps you pick up languages by instinct, preparing your brain for a language's repeated patterns. It's like we're throwing a ball to you in the same way over and over so that soon you can catch it without thinking about it. Lingo Jump is ideal to get beginners speaking a Hindi almost immediately. The parallel audio system also helps intermediate and advanced speakers achieve fluency in a new language. As you progress, the parallel audio system has you repeat phrases at their natural tempo, removing the slower versions. You can put your newly acquired listening and comprehension skills to the test in the final chapters, where you'll listen to the phrases without any parallel audio. This motivating feature helps you track your improvement, and gets you speaking Hindi with confidence. We've designed the first two chapters so that they offer easy immersion. Our speakers break down each word into their distinct syllables and speak slowly. This helps you catch every nuance of the language, making it easier for you to improve your listening and speaking skills all by yourself. We've specifically developed our language courses for audio learning, so you can complete other tasks while learning Hindi. You can learn while you are running, working out, walking, driving, or even when you are doing chores. Our parallel audio learning system teaches you wherever you are, without requiring a reference manual. To gain a deeper insight into the language you're learning, every Lingo Jump course includes a reference eBook, providing you more insight when you need it."